Do I have to pay a fee for Express to help me find a job? What types of jobs does Express fill? Does Express place people in full-time jobs or just temporary jobs? Check out the list of Frequently Asked Questions below for answers to these questions and more. Q: Do I pay any fees to Express for finding me a job? A: No, you are never charged a fee at Express to find a job. Q: What types of jobs does Express fill? A: All types! From Office Services jobs to Light Industrial jobs to Professional and Executive positions to medical, Express places many types of jobs at all levels. Available jobs will vary from one Express location to the next, so contact your local Express representative to learn about open positions. Or, search available jobs right here! Q: Does Express place people in full-time jobs and part-time jobs or just temporary jobs? A: Yes, Express provides a variety of ways you can work. Whether it's a full-time or part-time job or temporary assignments to work when you want to, we can help you find the right job to fit your needs and schedule. Q: What determines if I get assigned to a job through Express? A: One of our client companies sends us a job request. We match the best applicants for the job requirements. When you’re a match and the client company agrees, we’ll call to see if you’re available to work. If you accept the assignment, we’ll provide you with all the information you need. Once you complete the job assignment, contact your Express office to be placed back on our list of available workers to be considered for future assignments. Q: Do I have to accept every job assignment? A: It’s always your choice whether or not to accept an assignment. Flexibility is an Express advantage. Once you accept an assignment though, we depend on you to complete it. Q: How long are the job assignments? A: Assignments can last from four hours, to a few weeks or even months. Some assignments can even develop into a full-time position. We will let you know the approximate length of the assignment before you accept it to make sure your availability is a match for the job requirements. Q: What is the benefit of accepting a temporary job? A: A temporary job assignment allows you to earn a paycheck while you explore career fields and gain new skills. Contacts you make on a temporary assignment can lead to a full-time position, future work and positive references. Q: How many temporary jobs turn into full-time positions with client companies? A: According to the American Staffing Association, 80% of companies that use staffing services say staffing firms offer them a good way to find new employees. And, 77% of employees working through staffing companies say those jobs are a good way to find full-time employment. Q: What is the average length of a temporary assignment? A: While all job assignments and client companies are different, the average length of an individual temporary assignment with Express is 16 weeks. Once you complete a job assignment, contact your Express office to be placed back on our list of available workers to be considered for future assignments. Q: What is the average number of hours per week in a temporary assignment? A: While we can’t guarantee a specific number of hours, Express Associates average 37 hours per week. All job markets vary and number of hours will vary based on a client company’s needs. According to the American Staffing Association, 79% of staffing employees work full-time hours. However, one of the benefits of working with a staffing firm is that you have more control to tailor how you work to your lifestyle. Q: How often can I work? A: It depends on a variety of factors, including your availability, how often you’d like to work, how in-demand your skills are, and if we have jobs available for your skill set. Visit our Career Development section for resources to help make your skills more marketable. Q: I have a friend who is looking for work; can Express help them? A: One-third of all Express associates come from associate referrals. We have a long history of helping our associates’ friends and families find good jobs, and we appreciate their referrals. Q: What is a “Workforce Account”? A: A Workforce Account is an online portal where Express associates can access important information like their payroll information or W-2 statements. 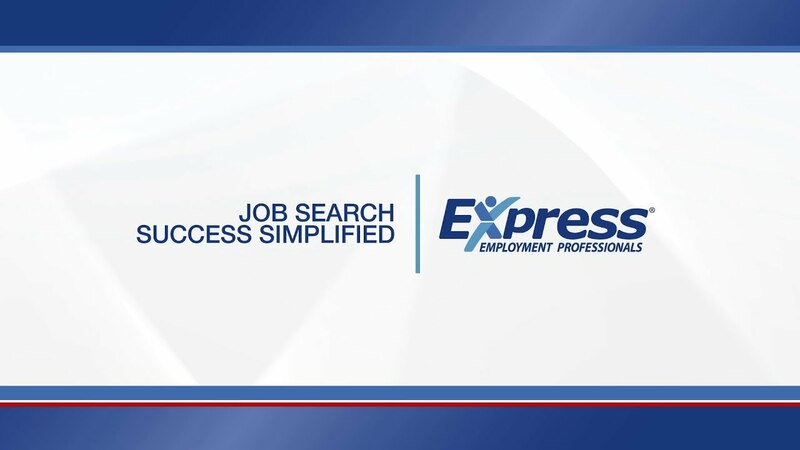 To create a Workforce Account, go to Workforce.ExpressPros.com. Q: What does franchising mean? A: Franchising is the practice of selling the right to use a company’s successful business model. Your local Express office owner invested in the right to use the award winning, proven methods and tools for staffing from Express Employment Professionals International Headquarters. Your local Express team members are experts on the job market in your community and have access to all the resources of the international company. Have more questions? Contact an Express representative. We're here to help.